If you’ve been involved in an automobile accident, it’s critical that you seek care right away. At Parascak Family Chiropractic, we use Kinetisense, Insight nerve scans and digital X-rays to provide the most objective data to quickly determine the diagnosis for patients. We then can devise an effective treatment plan to ensure their success in getting better long term. As the effects of whiplash aren’t always felt immediately following an accident, it’s essential to see your chiropractor as soon as you can after a car accident. If left untreated, whiplash can evolve into long-term pain. Your auto insurance covers you for a minimum of 10 chiropractic treatments for minor injuries under the Alberta Diagnostic Treatment Protocols Regulation. So, you are entitled to see your chiropractor at no charge to you regardless of who was at fault in your accident. More information about your coverage for treatment after a car accident is available here. What happens to your body (neck/spine) in a car accident? Acceleration-deceleration of the neck/spine from even a low impact collision can cause not only soft tissue injury but also neurological stress in the nerves in your neck. Stress on the nerves in your neck can cause dizziness, light-headedness, and visual and balance issues. With enough force, the whiplash injury also can cause spinal joints in the body to misalign (subluxate) and lead to abnormal movement patterns and dysfunction causing weaknesses of the body even with activities of daily living. Why is it essential to seek chiropractic care for these injuries? Chiropractic adjustments correct the misalignments in the spine restoring proper alignment and movement and relaxing the nervous system to optimize healing as quickly as possible. Exercises and other rehab approaches are supportive as the body is healing, but the healing first happens with the spinal adjustment. What issues can arise for someone who doesn’t seek treatment for their injuries (long-term effects of whiplash/subluxations – i.e., arthritis, postural problems, pain, muscles negatively compensating for the injury)? We have seen hundreds of patients over the years that have come in later on in life suffering from whiplash complications that were not detected, managed properly or were just simply minimized by the patient at the time thinking if the pain goes away then the problem is solved. 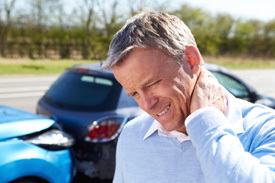 Unfortunately, with whiplash injuries, the pain goes away in most cases with time, but unless you are properly assessed at the time of the accident, then it is difficult to be aware of what impact the accident may have had on your body. You can’t base your health on your symptoms alone. How long can the patient expect to be in the office for the initial appointment? The initial appointment is about an hour and similar to what is done with all new patients who come to the office except there is more paperwork. We complete this together to be sure the insurance companies have all the proper documentation to open a claim and provide coverage for everyone depending on their diagnosis. Do you take X-rays or MRIs? We do spinal X-rays, nerve scans, and Kinetisense functional movement testing. Yes, once the claim has been approved. All claims in our office have been accepted with 100% agreement based on the details of our examinations. Healing takes time. Auto accidents provide initial coverage for the first 90 days from accident date. Our goal is to provide a program that helps our patients heal as quickly as possible in hopes that full recovery happens. If full recovery hasn’t happened in the first 90 days, then Section B benefits provide support, and the insurance companies will continue to assist the patient with ongoing treatments if necessary. Do you recommend any treatments other than chiropractic care and are these services offered in your clinic? Yes; we also strongly recommend massage therapy, acupuncture and physio in conjunction with our chiropractic adjustments but we decide this with patients depending on what they have tried in the past and what has worked for them before. We also offer at-home exercise programs to improve functional movement. If you’ve been involved in an auto accident, please seek care right away. Contact us today to schedule an appointment.